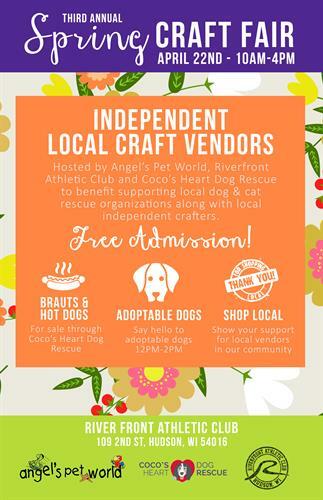 Hosted by Angel's Pet World, Riverfront Athletic Club, and Coco's Heart Dog Rescue to benefit supporting local dog and cat rescue organizations along with local independent crafters! Admission is free! There will be brats and hot dogs for sale through Coco's Heart Dog Rescue, say hello to adoptable dogs, and show your support for local vendors in our community.